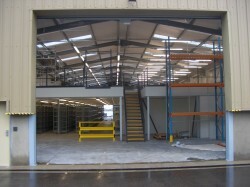 Hampshire Mezzanine Floors of Southampton won a major refurbishment project for Jersey Telecom. The project was to fit out a new main stores facility to amalgamate 3 separate warehouses into one main stores, thereby improving the efficiency and running of one main operation. 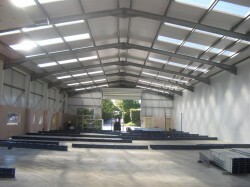 Hampshire Mezzanine Floors, as part of the £400K fit out, designed the stores, which included a large mezzanine floor, offices, workshop, services, toilets and kitchen. Also HMF supplied space efficient Dexion Pallet Racking, Longspan Shelving and Cable Drum Racking. Hampshire Mezzanine Floors, as Main Contractor, also completed the complete mechanical and electrical design and installation of the building including energy efficient air conditioning heating and building services. The mezzanine project was built over a 3 month fast track programme, some 3 weeks ahead of programme, allowing Jersey Telecom to take possession early. Hampshire Mezzanine Floors have completed a number of projects in recent years in the Channel Islands, including another fast track fit out for Play.com, a mezzanine fit out for Jersey Dairy at the new island facility and hand developed a network of approved Jersey suppliers to work with in conjunction with Hampshire Mezzanine Floors specialist activities.